A rabbit spirit recently freed from his statue shrine. He's rather childlike and mischievous and has a nack for electricuting things. Age: several thousand but sounds and acts like a child. Abilities include manipulation of lightning, electricity and wind. He can appear to teleport around due to his fast movement speed, and is often accompanied by the sound of thunder and static electricity in the air. 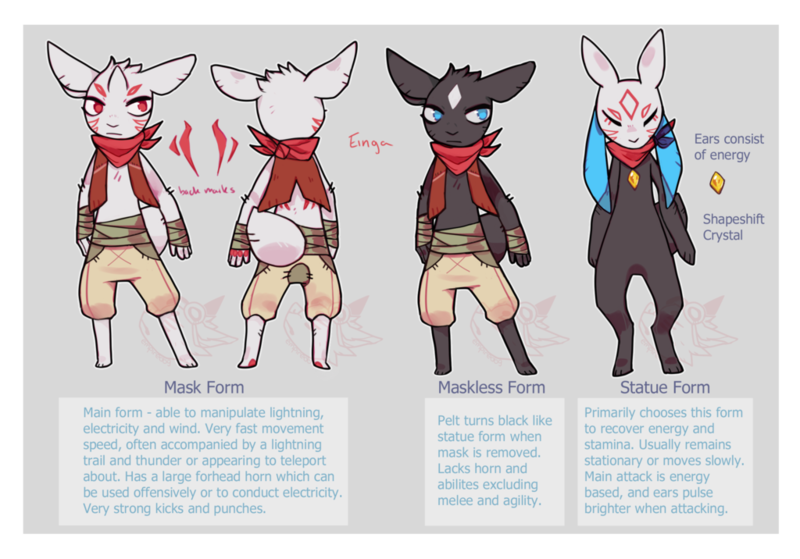 Has several forms, The white masked form is the appearance he takes when using the shapeshift crystal. He has to physically touch the crystal to take his masked from. The black, maskeless form is when he "removes" the mask. It sort of melts out of his body and takes a shape similar to the statue form. In this form he lacks most supernatural abilities but it still rather agile, and good at close combat melee. When his statue was shattered, the mask fell to the ground and a black liquid like substance leaked from it, taking the form of his statue-like anthro form.